On May 24, 2015, some 10,000 Albertans made their way to the legislature. The wading pool was full of kids and grown-ups splashing around, there were frozen treats and food trucks, and Edmonton folk band 100 Mile House entertained the crowd. It was a festival atmosphere, but what was happening on the legislature steps that afternoon was something very different: the swearing in of Alberta’s first NDP premier and her cabinet. Rachel Notley’s NDP had been elected on a platform of change. This was on full display at the legislature that Sunday afternoon. Notley had the legislature main doors unlocked for the first time since the Parliament Hill shooting seven months earlier, and she invited all Albertans to attend and celebrate. Swearing-in ceremonies are typically conducted behind closed doors with 100 or so VIPs in suits watching as newly minted premiers and cabinet ministers recite their oaths of office and are solemnly welcomed by the Lieutenant Governor. Notley, however, turned tradition on its head. 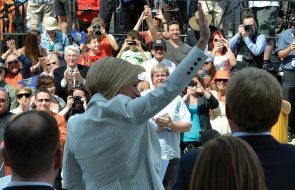 This was Alberta’s first outdoor and public swearing-in, the first new party to take office in 44 years and the first gender-balanced cabinet in Canadian history. This new approach, combined with the NDP’s historical advocacy for fair and progressive taxes, labour rights, environmental protection, higher resource royalties and strong public services, generated hopes for significant change among many Albertans. Many others, however, reacted with fear and trepidation about the potential impacts on oil and gas investment, tax rates and public spending. These early indications of a moderate, big-tent government were likely driven equally by Notley’s desire to build unified popular support and an urgent need to avoid panic by investors and the business community. Oil prices when the NDP formed government were the lowest they had been in over a decade, with a barrel of West Texas Intermediate crude having dropped from US$111 in June 2014 to $49 in July 2015. It would continue dropping until bottoming out at just under $36 in January 2016. Notley didn’t need an exodus of investment dollars, more job losses and further economic uncertainty. She had to secure business support, especially the oil and gas sector. Notley also faced the challenge of assembling a transition team in a province where nobody had overseen an actual transition in government in four decades, and where the only political operatives with government experience were Progressive Conservatives. Only four of the 54 NDP MLAs elected had any experience at all in the Alberta legislature. Even senior members of the bureaucracy, the people entrusted with briefing the new government on all policy areas, had only ever worked under PC premiers and ministers, and their worldviews, ways of working and possibly even their loyalties reflected that reality. 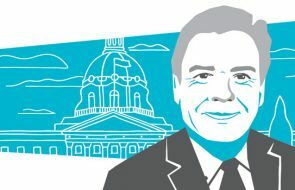 Despite these challenges, Notley moved quickly on the key planks in her ambitious election platform during her first legislative session, in June 2015. In just two weeks the government passed legislation banning corporate and union donations to political parties, scrapping the 10 per cent flat tax, and approving $18.5-billion in interim spending for health, education and human services. In many ways these three bills formed the foundation for the government’s policies over the next four years. Ending corporate and union donations was the govern-ment’s first step in reining in a wild west of party and campaign finances, patronage and entitlement. This first bill was eventually built upon, with legislation reducing individual political contributions from $15,000 annually (or $30,000 in an election year) to $4,000, and setting campaign spending limits for the first time in Alberta’s history. The government created new rules for party leadership and nomination races, and tightened the spending and disclosure rules for third-party advertisers. The rules themselves, particularly the contribution limit, fell short of what many advocates had been pushing for, but the change was nonetheless significant. This was also the case with Bill 2, which added new tiers for personal income taxes. In 2001 Ralph Klein’s government had scrapped Alberta’s system of progressive taxation and introduced a single rate of 10 per cent. The flat tax, which formed the core of Klein’s so-called “Alberta Advantage,” was by 2006 costing the provincial treasury $5.5-billion annually. The NDP’s Bill 2 added four new rates for anyone earning over $125,000, with the highest, 15 per cent, kicking in at $300,000. Although over 90 per cent of Albertans didn’t see a tax increase, the change in philosophy was clear and decisive. The same bill raised the corporate tax rate from 10 per cent to 12 per cent, making Alberta the only province in western Canada to jump out of “the race to the bottom” in terms of corporate taxes. In a place where over the previous three decades “tax” had become a dirty word, Albertans had not only elected a party that promised to increase taxes, they then accepted that increase with next to no protest or outcry. The Notley government’s third bill was actually the most transformational. On the surface, Bill 3 was a simple interim supply bill that provided government funding until a budget could be passed in the fall. The government communications accompanying the bill, however, made clear that its purpose was to reverse cuts made by the previous government to healthcare, K–12 and post-secondary education, as well as to increase funding to Human Services. Bill 3 sent a clear signal that this government would not slash public services, even though the drop in the price of oil precipitated a drop in provincial revenues. Klein cut services when revenues were low and invested only when the economy was booming. The result of his ideology was high inflation, worker shortages and an overheated economy during the good times, and higher unemployment and reduced supports during the bad times. Throughout its four-year term the NDP government refused to cut public service spending, declined to lay off public sector workers or roll back their salaries, and invested tens of billions in public infrastructure. The obvious negative result of this commitment was a level of public debt previously unseen in Alberta, but the investment also meant that Alberta weathered the economic downturn much better than neighbouring Saskatchewan, which kept up the practice of cutting and slashing during the downturn. The return to counter-cyclical spending was not, however, the only significant culture shift brought about during the NDP’s first few months in power. On November 22, 2015, while sharing a stage with the CEOs of Alberta’s largest oil companies as well as environmental, Indigenous and labour leaders, Notley introduced Alberta’s Climate Leadership Plan. Developed with the advice of an expert panel and based on extensive consultations, its key recommendations accelerated the phase-out of coal-fired power and created an economy-wide carbon levy, an absolute cap on oil sands emissions, a plan for reducing methane emissions, and a provincial agency devoted to energy efficiency. Any one of these initiatives would have been unfathomable in Alberta just seven months earlier, yet here was Notley introducing all of them, and with the full and high-profile support of leaders from the oil industry and the environmental community. Notley’s early efforts to reach out to the province’s oil industry had clearly succeeded, yet she somehow managed to do it without losing the support of mainstream environmentalists. The climate plan wasn’t universally applauded. Some environmentalists felt the carbon levy was too low to make a difference and were concerned that the 100 Mt oil sands emissions cap still represented growth of over 40 per cent. People on the right objected that the carbon levy wasn’t fully revenue neutral or was simply another tax in disguise. Those voices weren’t in the majority. That dynamic would shift later as the opposition worked to build up anti-tax fervour and environmentalists grew increasingly frustrated by Notley’s unfaltering support for pipelines and oilsands expansion. The climate plan was not the government’s only major piece of environmental legislation. They created Castle Provincial Park and expanded Castle Wildland Provincial Park in order to protect wildlife corridors and species at risk and limit future development in the Castle–Crown region. Recently they announced plans to protect the Bighorn area between Jasper and Banff, which will ultimately include up to four new provincial parks. However, some environmentalists were still disappointed: In both cases the government conceded continued use of the parks to off-highway vehicles and grandfathered existing grazing rights. The honeymoon came to a screeching halt in early December 2015, when the government introduced Bill 6, the Enhanced Protection for Farm and Ranch Workers Act. The bill’s primary purpose was to extend occupational health and safety provisions, as well as mandatory WCB coverage, to farm workers. Such provisions had been recommended in internal reports to previous Alberta governments and reflected the law in most other provinces. In contrast to the Climate Leadership Plan, however, the government did next to no advance work with stakeholders, particularly farmers. From conception to drafting to rollout, Bill 6 proved a significant failure in communication. Angry farmers mounted boisterous rallies at the legislature, Notley’s approval ratings tumbled and the opposition seized the opportunity to rebuild support, starting with a core rural constituency. The bill highlighted the cabinet’s lack of experience. Notley had to address the fallout while at the Paris Climate Summit, where she was promoting Alberta’s climate plan to the world. It also cast into doubt her government’s strategy of hiring former reporters rather than seasoned political staff to run government communications. The NDP government learned an important lesson from the failure of the Bill 6 rollout: Even reasonable legislation must be accompanied by strong consultation, outreach and communications. Ultimately, the need to retroactively bring farm groups on board with Bill 6 and its provisions resulted in the actual rules being far more compromised than was necessary. Every major policy decision the government embarked on after Bill 6 began with the appointment of a broad, multi-stakeholder panel to research and consult on the options and report back with recommendations, and culminated with an active engagement and dissemination strategy. No one voice had privileged backroom access to policymakers; recommendations emerged from public engagement; and every policy introduction was accompanied by a far-reaching advertising and promotion campaign. More often than not, this resulted in moderate policies that reflected compromise and earned broad public support. This was perhaps most evident in the government’s fulfillment of their promise to review royalty rates within their first year in office. It set up a panel chaired by Dave Mowat, former president and CEO of ATB Financial, and gave the panel a clear mandate. A series of expert working groups then consulted, researched and made recommendations about the province’s royalty regime. The process was thorough, but despite its best efforts to include a broad range of stakeholders, it was heavily dominated by industry voices, if only because they had the resources such an intense consultative process requires. The ultimate result was a set of recommendations that made practical changes to how royalties are calculated and reported for conventional oil and gas, but that largely left what companies paid in royalties untouched. Although industry applauded, the decision created some tension between the NDP and much of its traditional base, which was expecting the government to raise Alberta’s royalty rates. On this, one of their key platform planks and an issue that had been at the core of NDP opposition to PC governments for years, the NDP turned away from its previous position and took the approach recommended by industry and Alberta conservatives. In fact, on a number of issues the NDP moderated its previous position for the sake of achieving change without rattling too many cages. For example, the review of the Workers Compensation Board fell short of addressing critiques of reparation and compensation for workers, and consequences for employers that actively suppress claims. These were things that Notley herself had advocated for years. The reviews of the Alberta Labour Relations Code and the Employment Standards Code prompted significant and positive changes to what had for decades been the most worker- and union-unfriendly laws in the country, but ultimately only brought Alberta up to the middle of the Canadian pack. The failure to change employers’ ability to compel overtime and fire workers for no reason—and refusal to end construction firms’ capacity to evade union agreements—left many labour activists disappointed. A notable but quiet labour outcome was the government’s negotiating wage freezes with every major public sector union while managing to avoid labour strife. This improved the government’s long-term financial picture. But Notley could hardly boast about the savings, given her party’s base; the opposition, meanwhile, was loathe to give her any credit. Because of the NDP’s historical role at the forefront of the fight back against the many privatization and delisting efforts of previous governments, many Albertans had high hopes for what the NDP could accomplish in healthcare. Notley’s government immediately rolled back the funding cuts and healthcare premiums that Prentice had introduced, and made good on a promise not to cut healthcare spending. Key infrastructure included the new Cancer Treatment Centre at Foothills Hospital and a redeveloped maternity unit at Peter Lougheed Hospital in Calgary, and a new emergency room for Misericordia Hospital as well as a new mental health clinic in Edmonton, plus an additional hospital wing in Medicine Hat. The NDP also made good on its promise to “end the PCs’ costly experiments with privatization” by stopping a proposed further privatization of AHS laundry services and by bringing medical testing back under public ownership and control. The government’s record on long-term care, however, is not quite as clear-cut. One of the NDP’s key platform promises was for the creation of 2,000 new public long-term care beds over four years. The government claims it’s on track to fulfill that promise, but it will do so only by taking some liberties with the definitions of “new” and “public.” Of the 2,000 beds that will be developed, over 1,600 will be through the Alberta Supportive Living Initiative, a program originally set up by the PC government to fund private and non-profit operators to build and run new facilities. In fact, some of those beds were already anticipated before the NDP came into office. Ultimately, despite poor government finances, there will be at least 2,000 more long-term care and dementia beds by the end of 2019 than there were in 2015. But the bulk of them will be private rather than public, which many core NDP supporters see as a failure. Notley’s government also focused on gender equality. The creation of a Ministry for the Status of Women and appointment of a gender-balanced cabinet were early signals that the NDP took such issues seriously. They changed the law to allow women to break leases in cases of domestic violence, made a medical abortion pill free, and legislated bubble zones around abortion clinics. 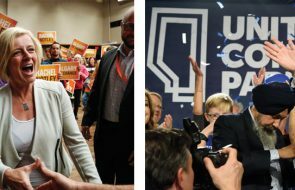 The latter two measures also provided an opportunity for the NDP to distinguish itself from the UCP when that party refused to engage on the issue. The government increased funding for and access to women’s shelters early in their mandate, which within two years had already made a visible difference: The use of outreach services by women and children fleeing domestic violence had increased by 45 per cent. With the introduction of a $25-a-day pilot project for daycare, the NDP highlighted its prioritization of gender equity and children’s well-being. The project and its subsequent expansion has certainly improved affordability, but questions remain about whether $25 a day really is manageable for Albertans with low incomes. Likewise, the overall number of daycare spaces didn’t increase much. The project does, however, indicate a commitment to fulfilling the NDP’s 2015 election promise of working toward an affordable, accessible and quality universal childcare system as finances permit. Perhaps where the NDP has been strongest is on social issues that don’t require large financial investments. A key one is its policy on LGBTQ+ issues, in particular the initiative to protect gay–straight alliances in schools. This legislation not only upholds rights and provides long overdue safety, the debates leading to its enactment allowed the government to paint Jason Kenney as intolerant for his statements in support of “outing” kids to their parents when they join a GSA. Another area of policy strength is social equity. Although Alberta remains Canada’s only province without a concerted poverty reduction strategy, small, targeted NDP government initiatives have made a difference. These include accelerating the introduction of the Alberta Child Benefit and the Alberta Family Employment Tax Credit, which, combined, annually provide over $300-million to families. Eligible families receive both benefits even if they don’t owe provincial taxes, and neither one affects families’ eligibility for complementary programs such as AISH, income supports or the childcare subsidy. Near the end of its term the government not only increased the amounts for AISH and other income supports for the first time since 2012, but also indexed those benefits to inflation so as not to erode their value and purchasing power over time. The government also introduced new, user-friendly forms and guides to help make the process easier for Albertans with disabilities, streamlined the application process, changed the adjudication guidelines, and improved communication so as to provide timely and useful information. All of these changes were designed through consultation with and input from beneficiaries—a far cry from the days when Ralph Klein would openly mock and demonize AISH recipients. One of Notley’s most significant and controversial changes was to increase the minimum wage to $15 an hour. With the final increase on October 1, 2018, some 300,000 Albertans had received a raise. Of those, 76 per cent were 20 or older, 63 per cent were women and over one-third were parents. In three years Alberta had gone from having the lowest minimum wage in the country to having the highest. This is one policy area where the NDP did not compromise, which may be partly why, as with the carbon tax, the opposition rallied many Albertans to their cause through anecdotes from business owners and surveys from industry advocates. The fact that the NDP government focused over the last 18 months almost exclusively on its quest for a bitumen pipeline to the Port of Vancouver has actually served to obscure the impressive number of bills it passed and the degree to which it has fundamentally transformed Alberta’s political and fiscal culture. From taxation to transparency and democracy, to climate change and the promotion of energy alternatives, this was undoubtedly the most activist government in recent Alberta history. At the same time, however, it would be inaccurate to characterize the NDP government as radical. Almost every major policy it implemented was developed through broad consultation, with voices from all stakeholders reflected in the outcome. Alberta’s oil industry was a key partner to this government every step of the way, and all major decisions were informed by the work of mainstream economists from respected schools—from U of A economist Andrew Leach’s work on the Climate Leadership Plan, to former Bank of Canada Governor David Dodge reviewing the government’s capital plan, to the key role of energy economist Peter Tertzakian in the royalty review. The result of these efforts was, more often than not, policies that either brought Alberta up to the middle of the pack in terms of other provinces, or, as with royalties and taxation, reinforced the economic status quo. Despite opposition efforts to paint the Notley government as extreme, the evidence clearly reveals a moderate government that got a lot done under difficult circumstances in a short time. Whatever the future holds, there’s no denying this government’s many accomplishments over the past four years and the extent to which Albertans got the change they voted for. Ricardo Acuña is executive director of the Parkland Institute and a frequent commentator on public policy issues in Alberta.